This article is about air conditioning. For similar concept in atomic physics, see Evaporative cooling (atomic physics). Externally mounted evaporative cooling devices (car coolers) were used in some automobiles to cool interior air—often as aftermarket accessories—until modern vapor-compression air conditioning became widely available. Passive evaporative cooling techniques in buildings have been a feature of desert architecture for centuries, but Western acceptance, study, innovation, and commercial application is all relatively recent. In 1974, William H. Goettl noticed how evaporative cooling technology works in arid climates, speculated that a combination unit could be more effective, and invented the "High Efficiency Astro Air Piggyback System", a combination refrigeration and evaporative cooling air conditioner. In 1986, University of Arizona researchers W. Cunningham and T. Thompson built a passive evaporative cooling tower, and performance data from this experimental facility in Tucson, Arizona became the foundation of evaporative cooling tower design guidelines developed by Baruch Givoni. Evaporative coolers lower the temperature of air using the principle of evaporative cooling,n]] or absorption refrigerator. Evaporative cooling is the conversion of liquid water into vapor using the thermal energy in the air, resulting in a lower air temperature. The energy needed to evaporate the water is taken from the air in the form of sensible heat, which affects the temperature of the air, and converted into latent heat, the energy present in the water vapor component of the air, whilst the air remains at a constant enthalpy value. This conversion of sensible heat to latent heat is known as an isenthalpic process because it occurs at a constant enthalpy value. Evaporative cooling therefore causes a drop in the temperature of air proportional to the sensible heat drop and an increase in humidity proportional to the latent heat gain. 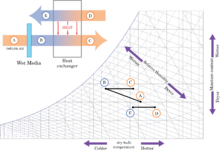 Evaporative cooling can be visualized using a psychrometric chart by finding the initial air condition and moving along a line of constant enthalpy toward a state of higher humidity. A simple example of natural evaporative cooling is perspiration, or sweat, secreted by the body, evaporation of which cools the body. The amount of heat transfer depends on the evaporation rate, however for each kilogram of water vaporized 2,257 kJ of energy (about 890 BTU per pound of pure water, at 95 °F (35 °C)) are transferred. The evaporation rate depends on the temperature and humidity of the air, which is why sweat accumulates more on humid days, as it does not evaporate fast enough. Vapor-compression refrigeration uses evaporative cooling, but the evaporated vapor is within a sealed system, and is then compressed ready to evaporate again, using energy to do so. A simple evaporative cooler's water is evaporated into the environment, and not recovered. In an interior space cooling unit, the evaporated water is introduced into the space along with the now-cooled air; in an evaporative tower the evaporated water is carried off in the airflow exhaust. A closely related process, sublimation cooling, differs from evaporative cooling in that a phase transition from solid to vapor, rather than liquid to vapor, occurs. Sublimation cooling has been observed to operate on a planetary scale on the planetoid Pluto, where it has been called an anti-greenhouse effect. Another application of a phase change to cooling is the "self-refrigerating" beverage can. A separate compartment inside the can contains a desiccant and a liquid. Just before drinking, a tab is pulled so that the desiccant comes into contact with the liquid and dissolves. As it does so, it absorbs an amount of heat energy called the latent heat of fusion. Evaporative cooling works with the phase change of liquid into vapor and the latent heat of vaporization, but the self-cooling can uses a change from solid to liquid, and the latent heat of fusion, to achieve the same result. Before the advent of refrigeration, evaporative cooling was used for millennia. A porous earthenware vessel would cool water by evaporation through its walls; frescoes from about 2500 BC show slaves fanning jars of water to cool rooms. A vessel could also be placed in a bowl of water, covered with a wet cloth dipping into the water, to keep milk or butter as fresh as possible. Evaporative cooling is a common form of cooling buildings for thermal comfort since it is relatively cheap and requires less energy than other forms of cooling. The figure showing the Salt Lake City weather data represents the typical summer climate (June to September). The colored lines illustrate the potential of direct and indirect evaporative cooling strategies to expand the comfort range in summer time. It is mainly explained by the combination of a higher air speed on one hand and elevated indoor humidity when the region permits the direct evaporative cooling strategy on the other hand. Evaporative cooling strategies that involve the humidification of the air should be implemented in dry condition where the increase in moisture content stays below recommendations for occupant’s comfort and indoor air quality. Passive cooling towers lack the control that traditional HVAC systems offer to occupants. However, the additional air movement provided into the space can improve occupant comfort. Evaporative cooling is most effective when the relative humidity is on the low side, limiting its popularity to dry climates. Evaporative cooling raises the internal humidity level significantly, which desert inhabitants may appreciate as the moist air re-hydrates dry skin and sinuses. Therefore, assessing typical climate data is an essential procedure to determine the potential of evaporative cooling strategies for a building. The three most important climate considerations are dry-bulb temperature, wet-bulb temperature, and wet-bulb depression during the summer design day. It is important to determine if the wet-bulb depression can provide sufficient cooling during the summer design day. By subtracting the wet-bulb depression from the outside dry-bulb temperature, one can estimate the approximate air temperature leaving the evaporative cooler. It is important to consider that the ability for the exterior dry-bulb temperature to reach the wet-bulb temperature depends on the saturation efficiency. A general recommendation for applying direct evaporative cooling is to implement it in places where the wet-bulb temperature of the outdoor air does not exceed 22 °C (71.6 °F). However, in the example of Salt Lake City, the upper limit for the direct evaporative cooling on psychrometric chart is 20 °C (68 °F). Despite this lower value, this climate is still suitable for this technique. Evaporative cooling is especially well suited for climates where the air is hot and humidity is low. In the United States, the western/mountain states are good locations, with evaporative coolers prevalent in cities like Denver, Salt Lake City, Albuquerque, El Paso, Tucson, and Fresno. Evaporative air conditioning is also popular and well-suited to the southern (temperate) part of Australia. In dry, arid climates, the installation and operating cost of an evaporative cooler can be much lower than that of refrigerative air conditioning, often by 80% or so. However, evaporative cooling and vapor-compression air conditioning are sometimes used in combination to yield optimal cooling results. Some evaporative coolers may also serve as humidifiers in the heating season. Even in regions that are mostly arid, short periods of high humidity may prevent evaporative cooling from being an effective cooling strategy. An example of this event is the monsoon season in New Mexico and southern Arizona in July and August. In locations with moderate humidity there are many cost-effective uses for evaporative cooling, in addition to their widespread use in dry climates. For example, industrial plants, commercial kitchens, laundries, dry cleaners, greenhouses, spot cooling (loading docks, warehouses, factories, construction sites, athletic events, workshops, garages, and kennels) and confinement farming (poultry ranches, hog, and dairy) often employ evaporative cooling. In highly humid climates, evaporative cooling may have little thermal comfort benefit beyond the increased ventilation and air movement it provides. Trees transpire large amounts of water through pores in their leaves called stomata, and through this process of evaporative cooling, forests interact with climate at local and global scales. Simple evaporative cooling devices such as evaporative cooling chambers (ECCs) and clay pot coolers, or pot-in-pot refrigerators, are simple and inexpensive ways to keep vegetables fresh without the use of electricity. Several hot and dry regions throughout the world could potentially benefit from evaporative cooling, including North Africa, the Sahel region of Africa, the Horn of Africa, southern Africa, the Middle East, arid regions of South Asia, and Australia. Benefits of evaporative cooling chambers for many rural communities in these regions include reduced post-harvest loss, less time spent traveling to the market, monetary savings, and increased availability of vegetables for consumption. Evaporative cooling is commonly used in cryogenic applications. The vapor above a reservoir of cryogenic liquid is pumped away, and the liquid continuously evaporates as long as the liquid's vapor pressure is significant. Evaporative cooling of ordinary helium forms a 1-K pot, which can cool to at least 1.2 K. Evaporative cooling of helium-3 can provide temperatures below 300 mK. These techniques can be used to make cryocoolers, or as components of lower-temperature cryostats such as dilution refrigerators. As the temperature decreases, the vapor pressure of the liquid also falls, and cooling becomes less effective. This sets a lower limit to the temperature attainable with a given liquid. Evaporative cooling is also the last cooling step in order to reach the ultra-low temperatures required for Bose–Einstein condensation (BEC). Here, so-called forced evaporative cooling is used to selectively remove high-energetic ("hot") atoms from an atom cloud until the remaining cloud is cooled below the BEC transition temperature. For a cloud of 1 million alkali atoms, this temperature is about 1μK. Although robotic spacecraft use thermal radiation almost exclusively, many manned spacecraft have short missions that permit open-cycle evaporative cooling. Examples include the Space Shuttle, the Apollo command and service module (CSM), lunar module and portable life support system. The Apollo CSM and the Space Shuttle also had radiators, and the Shuttle could evaporate ammonia as well as water. The Apollo spacecraft used sublimators, compact and largely passive devices that dump waste heat in water vapor (steam) that is vented to space. When liquid water is exposed to vacuum it boils vigorously, carrying away enough heat to freeze the remainder to ice that covers the sublimator and automatically regulates the feedwater flow depending on the heat load. The water expended is often available in surplus from the fuel cells used by many manned spacecraft to produce electricity. Most designs take advantage of the fact that water has one of the highest known enthalpy of vaporization (latent heat of vaporization) values of any common substance. Because of this, evaporative coolers use only a fraction of the energy of vapor-compression or absorption air conditioning systems. Unfortunately, except in very dry climates, the single-stage (direct) cooler can increase relative humidity (RH) to a level that makes occupants uncomfortable. Indirect and two-stage evaporative coolers keep the RH lower. Direct evaporative cooling (open circuit) is used to lower the temperature and increase the humidity of air by using latent heat of evaporation, changing liquid water to water vapor. In this process, the energy in the air does not change. Warm dry air is changed to cool moist air. The heat of the outside air is used to evaporate water. The RH increases to 70 to 90% which reduces the cooling effect of human perspiration. The moist air has to be continually released to outside or else the air becomes saturated and evaporation stops. A mechanical direct evaporative cooler unit uses a fan to draw air through a wetted membrane, or pad, which provides a large surface area for the evaporation of water into the air. Water is sprayed at the top of the pad so it can drip down into the membrane and continually keep the membrane saturated. Any excess water that drips out from the bottom of the membrane is collected in a pan and recirculated to the top. Single-stage direct evaporative coolers are typically small in size as they only consist of the membrane, water pump, and centrifugal fan. The mineral content of the municipal water supply will cause scaling on the membrane, which will lead to clogging over the life of the membrane. Depending on this mineral content and the evaporation rate, regular cleaning and maintenance is required to ensure optimal performance. Generally, supply air from the single-stage evaporative cooler will need to be exhausted directly (one-through flow) because the high humidity of the supply air. Few design solutions have been conceived to utilize the energy in the air like directing the exhaust air through two sheets of double glazed windows, thus reducing the solar energy absorbed through the glazing. Compared to energy required to achieve the equivalent cooling load with a compressor, single stage evaporative coolers consume less energy. Passive direct evaporative cooling can occur anywhere that the evaporatively cooled water can cool a space without the assist of a fan. This can be achieved through use of fountains or more architectural designs such as the evaporative downdraft cooling tower, also called a “passive cooling tower”. The passive cooling tower design allows outside air to flow in through the top of a tower that is constructed within or next to the building. The outside air comes in contact with water inside the tower either through a wetted membrane or a mister. As water evaporates in the outside air, the air becomes cooler and less buoyant and creates a downward flow in the tower. At the bottom of the tower, an outlet allows the cooler air into the interior. Similar to mechanical evaporative coolers, towers can be an attractive low-energy solution for hot and dry climate as they only require a water pump to raise water to the top of the tower. Energy savings from using a passive direct evaporating cooling strategy depends on the climate and heat load. For arid climates with a great wet-bulb depression, cooling towers can provide enough cooling during summer design conditions to be net zero. For example, a 371 m² (4,000 ft²) retail store in Tucson, Arizona with a sensible heat gain of 29.3 kJ/h (100,000 Btu/h) can be cooled entirely by two passive cooling towers providing 11890 m³/h (7,000 cfm) each. For the Zion National Park visitors' center, which uses two passive cooling towers, the cooling energy intensity was 14.5 MJ/m² (1.28 kBtu/ft;), which was 77% less than a typical building in the western United States that uses 62.5 MJ/m² (5.5 kBtu/ft²). A study of field performance results in Kuwait revealed that power requirements for an evaporative cooler are approximately 75% less than the power requirements for a conventional packaged unit air-conditioner. Indirect evaporative cooling (closed circuit) is a cooling process that uses direct evaporative cooling in addition to some type of heat exchanger to transfer the cool energy to the supply air. The cooled moist air from the direct evaporative cooling process never comes in direct contact with the conditioned supply air. The moist air stream is released outside or used to cool other external devices such as solar cells which are more efficient if kept cool. One indirect cooler manufacturer uses the so-called Maisotsenko cycle which employs an iterative (multi-step) heat exchanger that can reduce the temperature of product air to below the wet-bulb temperature, and can a approach the dew point. While no moisture is added to the incoming air the relative humidity (RH) does rise a little according to the Temperature-RH formula. Still, the relatively dry air resulting from indirect evaporative cooling allows inhabitants' perspiration to evaporate more easily, increasing the relative effectiveness of this technique. Indirect Cooling is an effective strategy for hot-humid climates that cannot afford to increase the moisture content of the supply air due to indoor air quality and human thermal comfort concerns. The following graphs describe the process of direct and indirect evaporative cooling with the changes in temperature, moisture content and relative humidity of the air. Passive indirect evaporative cooling strategies are rare because this strategy involves an architectural element to act as a heat exchanger (for example a roof). This element can be sprayed with water and cooled through the evaporation of the water on this element. These strategies are rare due to the high use of water, which also introduces the risk of water intrusion and compromising building structure. In the first stage of a two-stage cooler, warm air is pre-cooled indirectly without adding humidity (by passing inside a heat exchanger that is cooled by evaporation on the outside). In the direct stage, the pre-cooled air passes through a water-soaked pad and picks up humidity as it cools. Since the air supply is pre-cooled in the first stage, less humidity is transferred in the direct stage, to reach the desired cooling temperatures. The result, according to manufacturers, is cooler air with a RH between 50-70%, depending on the climate, compared to a traditional system that produces about 70–80% relative humidity in the conditioned air. In a hybrid design, direct or indirect cooling has been combined with vapor-compression or absorption air conditioning to increase the overall efficiency and/or to reduce the temperature below the wet-bulb limit. Traditionally, evaporative cooler pads consist of excelsior (aspen wood fiber) inside a containment net, but more modern materials, such as some plastics and melamine paper, are entering use as cooler-pad media. Modern rigid media, commonly 8" or 12" thick, adds more moisture, and thus cools air more than typically much thinner aspen media. Another material which is sometimes used is corrugated cardboard. In arid and semi-arid climates, the scarcity of water makes water consumption a concern in cooling system design. From the installed water meters,[original research?] 420938 L (111,200 gal) of water were consumed during 2002 for the two passive cooling towers at the Zion National Park visitors' center. However, such concerns are addressed by experts who note that electricity generation usually requires a large amount of water, and evaporative coolers use far less electricity, and thus comparable water overall, and cost less overall, compared to chillers. Allowing direct solar exposure to the media pads increases the evaporation rate. Sunlight may, however, degrade some media, in addition to heating up other elements of the evaporative cooling design. Therefore, shading is advisable in most applications. Apart from fans used in mechanical evaporative cooling, pumps are the only other piece of mechanical equipment required for the evaporative cooling process in both mechanical and passive applications. Pumps can be used for either recirculating the water to the wet media pad or providing water at very high pressure to a mister system for a passive cooling tower. Pump specifications will vary depending on evaporation rates and media pad area. The Zion National Park visitors' center uses a 250 W (1/3 HP) pump. Exhaust ducts and/or open windows must be used at all times to allow air to continually escape the air-conditioned area. Otherwise, pressure develops and the fan or blower in the system is unable to push much air through the media and into the air-conditioned area. The evaporative system cannot function without exhausting the continuous supply of air from the air-conditioned area to the outside. By optimizing the placement of the cooled-air inlet, along with the layout of the house passages, related doors, and room windows, the system can be used most effectively to direct the cooled air to the required areas. A well-designed layout can effectively scavenge and expel the hot air from desired areas without the need for an above-ceiling ducted venting system. Continuous airflow is essential, so the exhaust windows or vents must not restrict the volume and passage of air being introduced by the evaporative cooling machine. One must also be mindful of the outside wind direction, as, for example, a strong hot southerly wind will slow or restrict the exhausted air from a south-facing window. It is always best to have the downwind windows open, while the upwind windows are closed. Typically, residential and industrial evaporative coolers use direct evaporation, and can be described as an enclosed metal or plastic box with vented sides. Air is moved by a centrifugal fan or blower (usually driven by an electric motor with pulleys known as "sheaves" in HVAC terminology, or a direct-driven axial fan), and a water pump is used to wet the evaporative cooling pads. The cooling units can be mounted on the roof (down draft, or downflow) or exterior walls or windows (side draft, or horizontal flow) of buildings. To cool, the fan draws ambient air through vents on the unit's sides and through the damp pads. Heat in the air evaporates water from the pads which are constantly re-dampened to continue the cooling process. Then cooled, moist air is delivered into the building via a vent in the roof or wall. Because the cooling air originates outside the building, one or more large vents must exist to allow air to move from inside to outside. Air should only be allowed to pass once through the system, or the cooling effect will decrease. This is due to the air reaching the saturation point. Often 15 or so air changes per hour (ACHs) occur in spaces served by evaporative coolers, a relatively high rate of air exchange. Cooling towers are structures for cooling water or other heat transfer media to near-ambient wet-bulb temperature. Wet cooling towers operate on the evaporative cooling principle, but are optimized to cool the water rather than the air. Cooling towers can often be found on large buildings or on industrial sites. They transfer heat to the environment from chillers, industrial processes, or the Rankine power cycle, for example. Misting systems work by forcing water via a high pressure pump and tubing through a brass and stainless steel mist nozzle that has an orifice of about 5 micrometres, thereby producing a micro-fine mist. The water droplets that create the mist are so small that they instantly flash-evaporate. Flash evaporation can reduce the surrounding air temperature by as much as 35 °F (20 °C) in just seconds. For patio systems, it is ideal to mount the mist line approximately 8 to 10 feet (2.4 to 3.0 m) above the ground for optimum cooling. Misting is used for applications such as flowerbeds, pets, livestock, kennels, insect control, odor control, zoos, veterinary clinics, cooling of produce, and greenhouses. A misting fan is similar to a humidifier. A fan blows a fine mist of water into the air. If the air is not too humid, the water evaporates, absorbing heat from the air, allowing the misting fan to also work as an air cooler. A misting fan may be used outdoors, especially in a dry climate. It may also be used indoors. Small portable battery-powered misting fans, consisting of an electric fan and a hand-operated water spray pump, are sold as novelty items. Their effectiveness in everyday use is unclear. Understanding evaporative cooling performance requires an understanding of psychrometrics. Evaporative cooling performance is variable due to changes in external temperature and humidity level. A residential cooler should be able to decrease the temperature of air to within 3 to 4 °C (5 to 7 °F) of the wet bulb temperature. It is simple to predict cooler performance from standard weather report information. Because weather reports usually contain the dewpoint and relative humidity, but not the wet-bulb temperature, a psychrometric chart or a simple computer program must be used to compute the wet bulb temperature. Once the wet bulb temperature and the dry bulb temperature are identified, the cooling performance or leaving air temperature of the cooler may be determined. Evaporative media efficiency usually runs between 80% to 90%. Most efficient systems can lower the dry air temperature to 95% of the wet-bulb temperature, the least efficient systems only achieve 50%. The evaporation efficiency drops very little over time. Typical aspen pads used in residential evaporative coolers offer around 85% efficiency while CELdek[further explanation needed] type of evaporative media offer efficiencies of >90% depending on air velocity. The CELdek media is more often used in large commercial and industrial installations. Use a psychrometric chart to calculate wet bulb temperature, and then add 5–7 °F as described above. Use a rule of thumb which estimates that the wet bulb temperature is approximately equal to the ambient temperature, minus one third of the difference between the ambient temperature and the dew point. As before, add 5–7 °F as described above. At 32 °C and 50% relative humidity, air may be cooled to about 24 °C (75 °F). The dew point for these conditions is 20 °C (68 °F). (Cooling examples extracted from the June 25, 2000 University of Idaho publication, "Homewise"). Because evaporative coolers perform best in dry conditions, they are widely used and most effective in arid, desert regions such as the southwestern USA and northern Mexico. The same equation indicates why evaporative coolers are of limited use in highly humid environments: for example, a hot August day in Tokyo may be 30 °C (86 °F) with 85% relative humidity, 1,005 hPa pressure. This gives a dew point of 27.2 °C (81.0 °F) and a wet-bulb temperature of 27.88 °C (82.18 °F). According to the formula above, at 85% efficiency air may be cooled only down to 28.2 °C (82.8 °F) which makes it quite impractical. Estimated cost for professional installation is about half or less that of central refrigerated air conditioning. Estimated cost of operation is 1/8 that of refrigerated air conditioning. Power consumption is limited to the fan and water pump, which have a relatively low current draw at start-up. The working fluid is water. No special refrigerants, such as ammonia or CFCs, are used that could be toxic, expensive to replace, contribute to ozone depletion and/or be subject to stringent licensing and environmental regulations. Equipment can be installed by mechanically-inclined users at drastically lower cost than refrigeration equipment which requires specialized skills and professional installation. The only two mechanical parts in most basic evaporative coolers are the fan motor and the water pump, both of which can be repaired or replaced at low cost and often by a mechanically inclined user, eliminating costly service calls to HVAC contractors. The frequent and high volumetric flow rate of air traveling through the building reduces the "age-of-air" in the building dramatically. Evaporative cooling increases humidity. In dry climates, this may improve comfort and decrease static electricity problems. The pad itself acts as a rather effective air filter when properly maintained; it is capable of removing a variety of contaminants in air, including urban ozone caused by pollution, regardless of very dry weather. Refrigeration-based cooling systems lose this ability whenever there is not enough humidity in the air to keep the evaporator wet while providing a frequent trickle of condensation that washes out dissolved impurities removed from the air. Most evaporative coolers are unable to lower the air temperature as much as refrigerated air conditioning can. High dewpoint (humidity) conditions decrease the cooling capability of the evaporative cooler. No dehumidification. Traditional air conditioners remove moisture from the air, except in very dry locations where recirculation can lead to a buildup of humidity. Evaporative cooling adds moisture, and in humid climates, dryness may improve thermal comfort at higher temperatures. If there is moisture in the air there is a chance for metal objects in the room to get rusted over time, and is definitely not good if you have electronics such as a computer in the room. The air supplied by the evaporative cooler is generally 80–90% relative humidity and can cause interior humidity levels as high as 65%; very humid air reduces the evaporation rate of moisture from the skin, nose, lungs, and eyes. High humidity in air accelerates corrosion, particularly in the presence of dust. This can considerably reduce the life of electronics and other equipment. High humidity in air may cause condensation of water. This can be a problem for some situations (e.g., electrical equipment, computers, paper, books, old wood). Odors and other outdoor contaminants may be blown into the building unless sufficient filtering is in place. Evaporative coolers require a constant supply of water. Water high in mineral content (hard water) will leave mineral deposits on the pads and interior of the cooler. Depending on the type and concentration of minerals, possible safety hazards during the replacement and waste removal of the pads could be present. Bleed-off and refill (purge pump) systems can reduce but not eliminate this problem. Installation of an inline water filter (refrigerator drinking water/ice maker type) will drastically reduce the mineral deposits. Any mechanical components that can rust or corrode need regular cleaning or replacement due to the environment of high moisture and potentially heavy mineral deposits in areas with hard water. Evaporative media must be replaced on a regular basis to maintain cooling performance. Wood wool pads are inexpensive but require replacement every few months. Higher-efficiency rigid media is much more expensive but will last for a number of years proportional to the water hardness; in areas with very hard water, rigid media may only last for two years before mineral scale build-up unacceptably degrades performance. In areas with cold winters, evaporative coolers must be drained and winterized to protect the water line and cooler from freeze damage and then de-winterized prior to the cooling season. An evaporative cooler is a common place for mosquito breeding. Numerous authorities consider an improperly maintained cooler to be a threat to public health. Mold and bacteria may be dispersed into interior air from improperly maintained or defective systems, causing sick building syndrome and adverse effects for asthma and allergy sufferers. Wood wool of dry cooler pads can catch fire even from small sparks. ^ Kheirabadi, Masoud (1991). Iranian cities: formation and development. Austin, TX: University of Texas Press. p. 36. ISBN 978-0-292-72468-6. ^ Zellweger, John (1906). "Air filter and cooler". U.S. patent 838602. ^ Bryant Essick (1945). "Pad for evaporative coolers". U.S. patent 2391558. ^ Scott Landis (1998). The Workshop Book. Taunton Press. p. 120. ISBN 978-1-56158-271-6. ^ Gutenberg, Arthur William (1955). The Economics of the Evaporative Cooler Industry in the Southwestern United States. Stanford University Graduate School of Business. p. 167. ^ Such units were mounted on the passenger-side window of the vehicle; the window was rolled nearly all the way up, leaving only enough space for the vent which carried the cool air into the vehicle. ^ a b c Givoni, Baruch (1994). Passive and Low-Energy Cooling of Buildings. Van Nostrand Reinhold. ^ McDowall, R. (2006). Fundamentals of HVAC Systems, Elsevier, San Diego, page 16. ^ "History of Evaporative Cooling Technology". AZEVAP. 2005. Retrieved 22 November 2013. ^ Cryer, Pat. "Food storage in a working class London household in the 1900s". 1900s.org.uk. Retrieved 22 November 2013. ^ Bonan, Gordon B. (13 June 2008). "Forests and Climate Change: Forcings, Feedbacks, and the Climate Benefits of Forests" (Submitted manuscript). Science. 320 (5882): 1444–9. Bibcode:2008Sci...320.1444B. doi:10.1126/science.1155121. PMID 18556546. ^ Verploegen, Eric; Rinker, Peter; Ognakossan, Kukom Edoh. "Evaporative Cooling Best Practices Guide" (PDF). ^ Verploegen, Eric; Sanogo, Ousmane; Chagomoka, Takemore. "Evaporative Cooling Technologies for Improved Vegetable Storage in Mali - Evaluation" (PDF). ^ Peck, John F.; Kessler, Helen J.; Lewis, Thompson L. (1979). "Monitoring, Evaluating, & Optimizing Two Stage Evaporative Cooling Techniques". Environmental Research Laboratory, University of Arizona. ^ Kwok, Alison G.; Grondzik, Walter T. (2007). The green studio handbook: environmental strategies for schematic design. Architectural Press. ISBN 978-0-08-089052-4. ^ Grondzik, Walter T.; Kwok, Alison G.; Stein, Benjamin; Reynolds, John S. (2010). Mechanical and Electrical Equipment. John Wiley & Sons. ^ Energy Information Administration. "Annual Energy Review 2004". EIA. U.S. Department of Energy. Retrieved 12 December 2014. ^ Maheshwari, G.P. ; Al-Ragom, F.; Suri, R.K. (2001). "Energy-saving potential of an indirect evaporative cooler". Applied Energy. 69 (1): 69–76. doi:10.1016/S0306-2619(00)00066-0. ^ Jonathan Margolis. "Corrugated cardboard swamp cooler by Sundrop Farm". Theguardian.com. Retrieved 2018-09-25. ^ "Sundrop Farm's system". Sundropfarms.com. 2014-06-20. Retrieved 2018-09-25. ^ "Evaporative Cooling Design Guidelines Manual for New Mexico Schools and Commercial Buildings" (PDF). December 2002. pp. 25–27. Retrieved 12 September 2015. ^ Torcellini, P.; Pless, S.; Deru, M.; Long, N.; Judkoff, R. (2006). Lessons Learned from Case Studies of Six High-Performance Buildings - Technical Report NREL/TP-550-37542 (PDF). ^ a b HVAC Systems and Equipment (SI ed.). Atlanta, GA: American Society of Heating Refrigeration and Air-conditioning Engineers (ASHRAE). 2012. p. 41.1. ^ Krigger, John; Dorsi, Chris (2004). Residential Energy: Cost Savings and Comfort for Existing Buildings (4th ed.). Saturn Resource Management. p. 207. ISBN 978-1-880120-12-5. ^ "Evaporative cooler/ Evaporative cooler". Waterlinecooling.com. Retrieved 2013-11-22. ^ "A brief note on the NID Cooler" (PDF). Government of India - National Centre for Disease Control. Retrieved 22 November 2013. Holladay, April (2001). "A swamp cooler cools air by evaporation". WonderQuest Weekly Q&A science column. USAToday.com. Retrieved 2006-07-14. This page was last edited on 10 April 2019, at 17:23 (UTC).